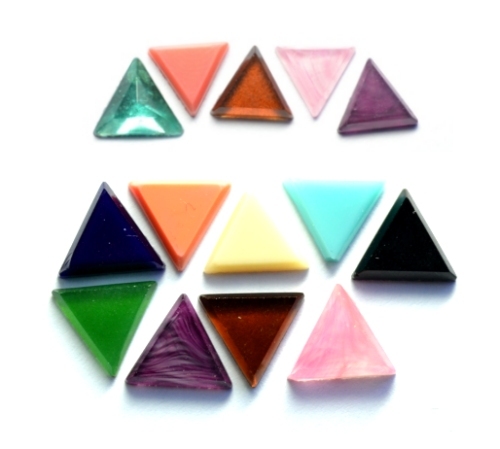 The chance to purchase the triangle crystals and stones which can be used to create Icos pieces of work from these instructions. 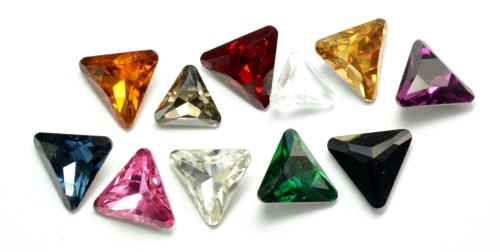 The crystals and stones shown are all sold in packs of 20 which is enough to make one pendant or bracelet and the price includes shipping world-wide. I also have the option to buy the beads needed to make a bracelet or pendant. If you would like to order different quantities or a mix of colours or sizes (e.g. pairs for earrings or 5 different colours so your pendant doesn't have the same colour touching itself) simply contact me. The crystals and stones available are all very limited. Sadly Swarovski have discontinued the crystals and all the other stones came from vintage warehouses on my travels so this is the last stock of them all that I can get. Please note that as the Small and Large stones are made from glass the colour and pattern on them have natural variations.